Spanish Inquisition: How Will Karim Benzema Respond To Emmanuel Adebayor's Arrival At Real Madrid? And Karim Benzema scored. Once again. Just like that. And Real Madrid won. Once again. Just like that. For the second successive game, Benzema was on target and for the second successive game Madrid won 1-0, keeping Barcelona in sight in the Spanish Primera Division, sustaining the chance to progress to the final of the Copa del Rey and feeding the hope of winning the treble. Problem is that this may not be enough for Benzema to merit a starting spot in Jose Mourinho's line-up week in, week out. This is not the first time that the 23-year-old France international striker has had a sensational week. He scored a hat-trick against Auxerre in the Champions League in December and later that month netted thrice against Levante in the Copa del Rey but both occasions turned out to be mere glimpses of Benzema's talent, as thereafter the Frenchman sank into depression and was repossessed by the inconsistency demon. 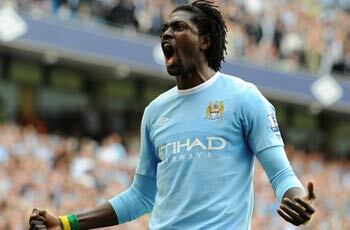 This time there is the additional Emmanuel Adebayor 'threat'. On the same day that Benzema was inspiring los Blancos to a 1-0 victory over Sevilla in the first-leg of their Copa del Rey tie, Adebayor was undergoing his medical and passing it too, and was being defined as a "physical marvel" - the additional striker that Mourinho has wanted since the start of the campaign, the antidote to Madrid's ailment. Adebayor arrives in the Spanish capital as the saviour of Madrid. A largely average striker, he is the No. 9 that Mourinho has been asking all this time, the centre-forward who would stick inside the opposition's penalty box and score the goals. Under other circumstances, Adebayor wouldn't have donned the 'sacred' white of Madrid and if Hamburg had been slightly less forceful about not letting go of Ruud van Nistelrooy, Mourinho wouldn't have thought of him. Yet what is essentially a six-month fling, a 'footballing rebound' if you would like, is going to compel the 26-year-old Togolese to give his all and commit himself whole-heartedly to the cause. This is the biggest club he will ever play for and there is the incentive that he could be rewarded with a permanent contract at the end of the campaign. All of which means that the future of Benzema at Madrid is uncertain and depends, partly at least, on Mourinho. Of course, the Portuguese has publicly backed the Frenchman but he also opted not to start him against Almeria, deploying Cristiano Ronaldo as the centre-forward instead. Now with the added option of Adebayor, one suspects that Benzema could perennially be consigned to the role of a (super?) sub. The former Olympique Lyonnais forward is not exactly brimming with confidence and must have realised by now that he is on thin ice, and if Adebayor starts to score he could be in for a tough six months. Competition is good and often raises the performance level but for Benzema it could be detrimental. He has the talent but often lacks the self-belief when things are not going his way. He has been among the goals this season but he has often looked lost, blunt and immobile; if you believe in the judgement of Luciano Moggi, then he is tactically inflexible. Benzema isn't a No. 9 and when asked to play that role, he has failed. Adebayor will lead the Madrid attack in the next few games and if Mourinho gets the best out of him, then it could spell the end of Benzema's tenure at the Bernabeu. For better or for worse.